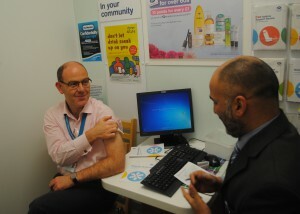 South Gloucestershire’s Director of Public Health Professor Mark Pietroni received his flu jab at a pharmacy in Yate earlier this week to help highlight that free flu vaccinations are available for thousands of people across South Gloucestershire who are at increased risk from flu. Flu vaccinations are available for free to all vulnerable groups including people aged 65 or over, pregnant women, those with long-term conditions and children aged two, three and four years old. People living in long-stay residential homes and children of school years 1 and 2 are also eligible for the vaccination. As well as being available from your local GP, this year free flu jabs for vulnerable groups are also available from community pharmacies through the NHS. The World Health Organization recommends people in the groups above should be vaccinated to prevent the virus being able to circulate at a harmful level. The seasonal flu vaccination must be done annually to be effective. “Every year, some 750,000 people nationwide visit their doctor with flu symptoms with about 27,000 people needing hospital treatment. If more people receive the vaccine then there will be fewer people with flu and so fewer people that others can catch flu from and fewer hospital admissions. This year the campaign includes a national flu vaccination programme for children, which seeks to help over three million two to six year olds, as the programme is extended to children in school years 1 and 2. In areas where the vaccination is not offered through schools, children will be offered the vaccination at their local GP or pharmacy.